Blitzen Trapper have cohesively stirred their nostalgic influences into a single, wildly chaotic sonic joyride. Who's your favorite '70s band? Odds are, Blitzen Trapper sound like them. It's hard not to play "guess the influences" with this Portland, Oregon sextet. From track to track, singer/guitarist Eric Early and company bounce from folk rock to prog, psychedelic pop to southern rock without breaking a sweat, paying homage to their forefathers without ever ripping them off. That's the key. There are tons of great Skynyrd cover bands out there (or wait...are there? 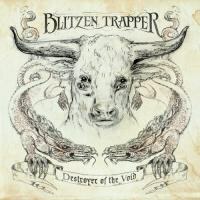 ), but what makes Blitzen Trapper so unique is that they manage to cohesively stir these nostalgic influences into a single, wildly chaotic sonic joyride. It's almost impossible to give these songs a single genre title. I'll go with "art-roots-rock" for now (but I'll get back to you when I think of something catchier). 2008's critically acclaimed Furr was an eclectic journey back to the stoned age. Its finest tracks are exciting, re-playable slices of roots-tinged rock and roll. Here, though, the band manages to find a sense of collective unity between tracks, something Furr failed to do. Destroyer of the Void is more consistent and inventive, from its beefed-up production to its refreshing instrumentation (most striking: the spine chilling graveyard harmonicas and psychedelic, effects-drenched guitar solos). This time, Blitzen Trapper have made an album you can listen to front to back in one sitting, not just a collection of great but unrelated moments. The title track, with its endlessly morphing chord progression and twangy vocal harmonies, recalls Furr's "Sleepytime in the Western World", but it also demonstrates the band's impressive array of instrumental textures, bouncing from CSNY-style chamber folk to Wings-era McCartney gospel balladry, always organically, never jarringly. It's a quintessential display of their shape-shifting abilities, and it serves as a good introduction to what they do best. It's almost as if Early wants to get the obvious reference points out of the way... early. Hell, he manages to name-check two of the world's most famous classic rock songs in the album's first 10 seconds: "Here's to the lone and wayward son / for to love is to live / for to roll like a rolling stone." "For to roll"? These guys even have authentic backwoods grammar! With its glorious 12-string acoustic guitars and angelic piano, "Below the Hurricane" evokes progressive, Peter Gabriel-era Genesis (circa Trespass) before settling into a funky, ghostly folk groove. It's downright beautiful, and even more impressive is the sense of excitement that's brewing. Early's vocals manage to conjure a sense of fragile majesty. The arrangements never slip into pomposity, building tension and melody equally as the song progresses. It's incredible. It could end up as one of the year's most spellbinding tracks. If you were wondering when I was going to mention Bob Dylan, your wait is over. "The Tree" just oozes prime Zimmerman, from the stripped-down acoustic fingerpicking to the ramshackle storytelling to the nasal drawl. Just listen to the way he rhymes "hear", "seer", and "atmosphere", pronouncing the final "atmos-phee-ah". When "The Man Who Would Speak True" opens with the line, "I had a lover / her name was Grace", you know you're in for a real Dylan moment. It's a wicked, chilling folk ballad with all the essential plot elements (romance, booze, firearms, midnight trains, The Law), and it only gets stranger as it goes along. Early sounds like he's spewing out the lyrics in a hazy, stream of consciousness fever: "I fed my tongue on the Devil's rum / in a roadhouse run by a godless bum / on a drunken night with a stolen gun / I shot my lover as she made to run." When Early sings, "For the truth, in truth, is a terrible jest", you believe him. In this indie rock age, too many bands are busy striving for flawless, genre-exclusive masterstrokes. Blitzen Trapper don't really seem to care about grand statements and definitely aren't afraid to show all their disparate origins or get a little dirt under their fingernails in the process. Blitzen Trapper are a mess, and they're all the more thrilling for it.